Indeed technology has become integral part of our society, from making coffee to doing money transactions to/from bank everything has been revolutionized by technology. I often deem at how technology has changed the way we dwell, think and accomplish our routine tasks, from trivial ones to complex ones. Gone are the days of bulky TVs, cassettes, VCRs and segregated radio devices etc. Most of these devices are extinct! There are new and efficient devices to replace them (for example the CD player replaces the VCRs and cassettes); and the devices which still exist have become all the more smart, Smart TV, Smart Fridges, Smart phones, Smartlaptops (the ultrabooks) and do on. But the question remains, are people too becoming equally smart to benefit from this smart technology in a smarter way? This digital wave is completely native to children of K2 generation. But for a house-wife aged 30, it’s fairly hard-to get along if not completely absurd. With a Masters degree in Physics, I am a woman who shows less of inertia towards high-end gadgets. I certainly like to use technology and modern gadgets may they be digital cameras, camcoders, palm-coders or smartphone. However using gadgets and completely understanding them are two notions poles apart. While I can easily use gadgets to serve the purpose, I am mostly unaware of what is happening in the background. And this makes trouble shooting for me, daunting. If technology is fine and straight-forward I am capable user. But if there is a small alteration to what I am accustomed to, technology all of a sudden becomes complex for me. This is where I strongly feel technology is still lagging. Technology might have transformed how we accomplish our routine tasks but it is still not ‘as much friendly’ for people who do not have technology know-how. For most of the computer-oriented-tasks I have to either depend on my husband or on tech professional for more complicated task (for example re-installation of Windows or data recovery). I have always visioned technology to integrate in our lives in a way it makes things simpler than complex. And now, I was confronted to one such situation which had made me feel that technology was increasingly difficult and perhaps unreliable. Yesterday I lost all my photos in a simple attempt to transfer data on my computer from the memory card. It was a week to go for my younger sister’s convocation ceremony. I had to empty my camera’s memory card to vacant space for new pictures in the upcoming event. 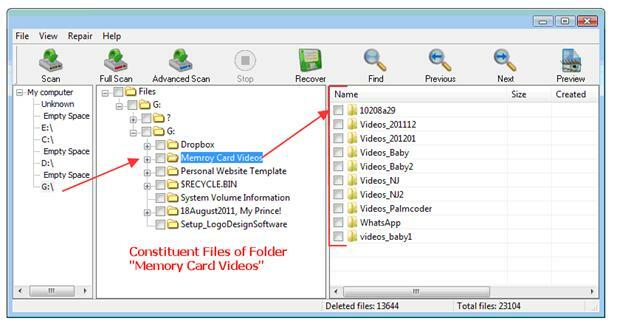 I very-well knew that data once deleted from memory sticks or memory cards cannot be recovered directly. This fact had always intimidated me to transfer files from memory card to laptop and clear the data on memory card. As a result the memory card was full of pictures and there was no space available for new images. I was waiting for my husband to assist me in transferring files but he could not spare time and above all he thought it was a pretty easy task that I could (should!) accomplish independently. I had delayed it, but could not delay any further. So I eventually decided to copy the photos from memory card to laptop, on my own. Every photo is a memory itself, and is as prized as any other photo, but these images had a special place in my heart. The photos I transferred were of a small party thrown for my 3rd wedding anniversary and number of shots of my son’s first year’s celebrations and lastly from our latest vacations to New Jersey. Especially when you are a new mom you happen to be more enthusiastic about your kid’s snaps, his first teeth, his first booties, his first weaning and so on. I am no different, I was eager to copy the snaps to my laptop and make a memorable scrapbook for my son’s first year. It was evident that I was extra cautious about the images. I had unplugged the memory card from the camera and inserted in my laptop. Simply copied all the files to a partition of hard disk (Drive D:) as I suspected the data was too large to fit in My Pictures folder on the Windows Drive. I initiated the process of copying. It took quiet long to copy owing to the large number of files. Eventually the photos were copied and I took a sigh of relief as I ensured all the photos were now present of my hard disk. After satisfying myself I deleted the content on my memory card. I had planned to make redundant copies of the photos once they were successfully copied to hard drive; but before that I wanted to organize photos in folders and sort them properly. As it was an extended work I decided to delay it for a couple of hours and get a refreshing cup of black tea. With the thought I had gone to the kitchen when I saw my little toddler rushed from somewhere in my room and started fiddling with the laptop. I did not have even a vague idea that my toddler is up to some destructive activity. I returned back to my room with a cup of tea wearing a great big smile (on my success of having accomplished a daunting task). I settled and looked up for the folders of copied images to sort. But the folders (particularly two important ones) were gone. I searched it with all possible ways but I could find nothing. All of a sudden it dawned on me that my toddler might have deleted the folder. Though just about 2 and half years he is capable to do much of computing tricks such as turning the computer on or off, tuning the volume, painting with MS Paint and last but not the least deleting files, probably it is the ‘red Delete button’ on my keypad which tempts him and he presses it which results in deletion of files. This was nothing new, he has been involved in this activity of deleting files. I was not very distressed on the loss of the folder because I have always recovered files deleted by my toddler from the Recycle Bin and it is quiet a usual practice for me by now. I headed towards the Recycle Bin, but to my utmost alarm, the folder was no where there too. The next thought to follow was even stern. The folder was indeed large for Recycle Bin to handle and it might have permanently deleted it. Before believing in the harsh reality I wanted to search every corner of my laptop for the folder. All the efforts went in vain. I began to realize that it was not the folder of images alone to be missing but also a couple of other folders comprising of my favorite books, magazine and a few documents; above all was a huge folder of e-books of my husband that surely was very important. I was instantly cheerless. I could do nothing but wonder how was my baby able to bring such destruction to our data; after all permanently deleting 4 to 5 folders was not a kid’s job. Scolding my toddler wouldn’t have solved the problem so I refrained from it. In panic, I was thinking of ways I could recover data. I searched for data recovery softwares on the internet and downloaded some very popular softwares. Most of the software were trial versions which enabled you to inspect the files/folders the software was able to recover and preview the quality of recovered files and photos. I was willing to purchase if any software was able to do the job for me. I started from one of the popular and so-called most effective software with a 10/10 rating by most websites. What I needed was simple software to recover my file that was deleted bypassing the recycle bin. This shouldn’t have been a big deal for decent software. As I reached the website of the software I was puzzled. The versioning of the software confused me. There software had independent versions for varied file systems and for varies scenarios of data recovery. It took me significant researching on the web to determine information about file systems and how to figure out the file system on my drive. I downloaded the software as the website proclaimed to be targeting novice too. After downloading and installing software I was utterly disappointed. Either the software was too complex or I was poor than a novice. The interface was increasingly complex and I was completely lost. After wasting another hour with the software I realized that the software was useless for me as it made simple recovery process complex through an incomprehensive interface. I had the same frustrating experience with another comparable software. Now this is why I find technology unreliable and complex. Data recovery must not be a task restricted to technology oriented persons. Everyone posses data and anyone can face data loss. Recovery softwares must be simple and must be designed to facilitate non-technical persons too. I headed towards downloading a different software. The software came from a very respectable software company and I expected it to do the job. Fortunately the software was nicely designed. The software successfully enumerated the folders I had lost. The software offered me to preview the files to ensure they were usable. Unfortunately the program failed to generate preview. I feared if I really had lost all the data. 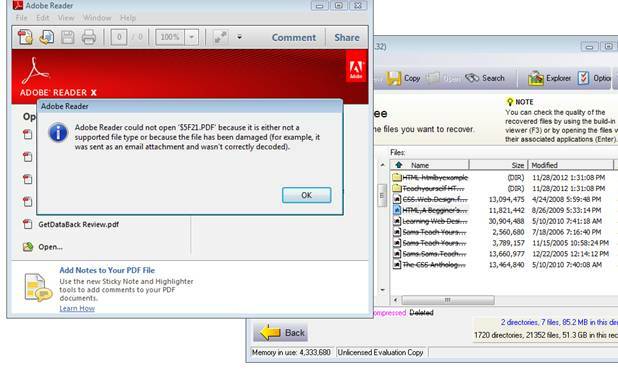 I downloaded yet recovery software, which too failed to generate preview of file generating error message that the file has been damaged. I was awfully anxious. Figure 1: Error Message from some software. After testing number of high-end efficient softwares I grabbed rather simplistic software. Surprisingly a where expensive professional grade fail, a decent software “FineRecovery” saved my day. Where most of the considerably expensive recovery softwares restrict their capabilities to a single platform, FineRecovery is cross-platform recovery software. 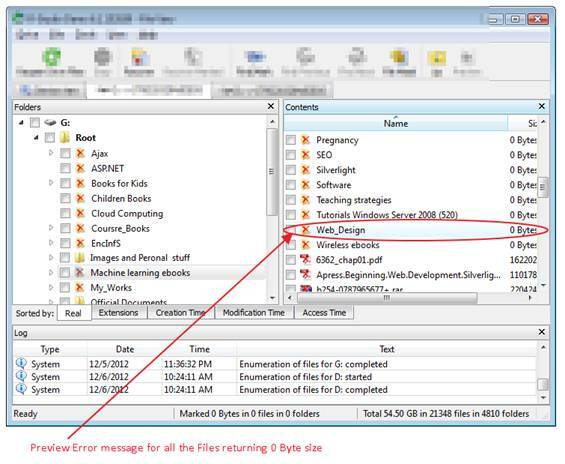 FineRecovery can be used to recover data lost on systems running Windows and Linux. When talking about recovery softwares, it is far more important for software to support older versions of operating systems than the latest versions of the OS. In this regard FineRecovery supports Windows 2000/XP/2003/2008/Vista/Windows 7. As mentioned previously, I had always considered recovery of files from removable media a task that requires highly professional-grade software. 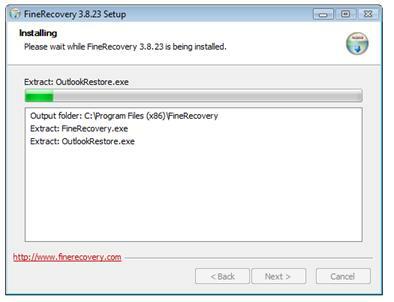 Before using FineRecovery, I tested some very extensive recovery softwares that are used in professional data recovery services. But not only were all of them costly, only one out of three of the softwares offered to recover data from removable media. 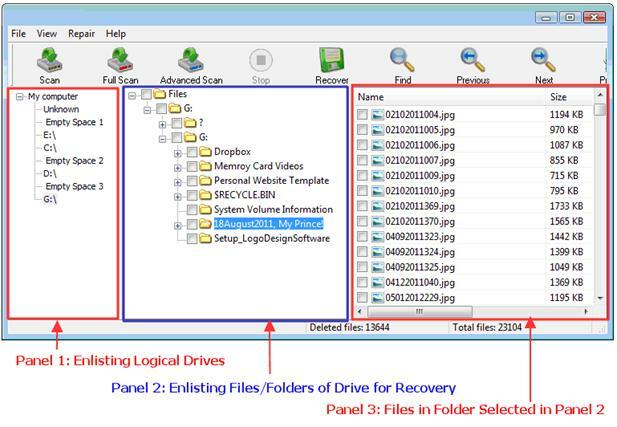 Finding that FineRecovery is cable to recover data from wide-range of removable media such as SD, a CF, MS, MMC, Flash Card and USB drive was a pleasant surprise. You do not have to undergo the hassle of downloading and testing a software that is in the end ineffective. For me this phase was particularly painstaking. I had downloaded 3 softwares, of which the first two softwares were completely incomprehensive for me. The last one enumerated most of the folders with their original name however constituent files were not recognized with their original name instead the files appeared with alphanumeric strings. In such a scenario identification of required files can be time taking. Moreover, for these paid softwares categorizing required file in heap of unidentifiable files is worthless as file recovery is only possible once you purchase the software, or in some cases demo versions would recover file which is 64kb in size. This can be a time consuming exercise (however most softwares do allow saving your selected recovery and loading later, may be after purchase of license to perform actual recovery). As pointed out before, in my prior attempt to download various softwares I found their respective websites to be increasingly complex. Particularly a famous recovery software had myriad of versions for different file systems, various set of tools besides the all-in-one utility. For a layman like me this can be baffling. When I accessed the FineRecovery website I found it to be very simplified. It is a common trend that we judge the software by its website; this is the reason why we tend to deem softwares with complex websites as more effective and the ones with a minimal website as less capable. The FineRecovery website is a simple one-page website with all the essential information you might require before recovery process. Initially the simplistic design made me wonder if the software, FineRecovery was capable recovery software. Nevertheless I decided to give it a try and downloaded the software. The software just about 3.8 MB took hardly a minute to download and within few minutes I was all set to install it. Installation process is simple and conventional. It is recommended that the software is not installed on drive from which you want to recover data. The recommendation is not made obvious in the installation process but highlighted in the FAQs on the website. This may mislead amateur users who are attempting data recovery for the first time. 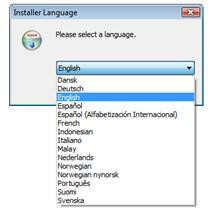 The program is available in some major languages including French, Dutch (Netherlands), Italian etc. The software has a very simple user-interface. Getting along the software was a piece of cake. 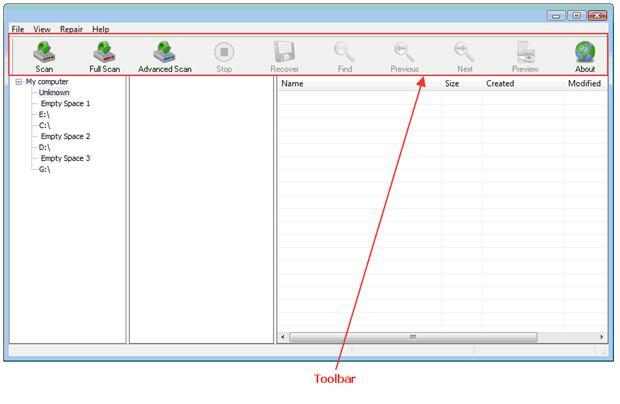 The software has a typical Windows Explorer interface comprising of a toolbar and three panels displayed in adjacently. The first panel details the drives and external disks. The second panel details the drive content while the last panel displays the detailed content in folders. When you select a drive and scan it, all the files/folders on a logical disk (both deleted and undeleted) appear on respective panels i.e. 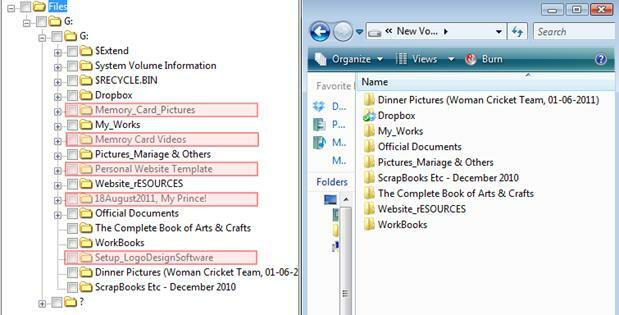 the second panel lists the folders while the third panel details the contents inside the folders selected in the second panel. A trivial interface glitch that I found was that there is no clear notification as to which files are deleted and which are actually present on the drive and are not deleted. 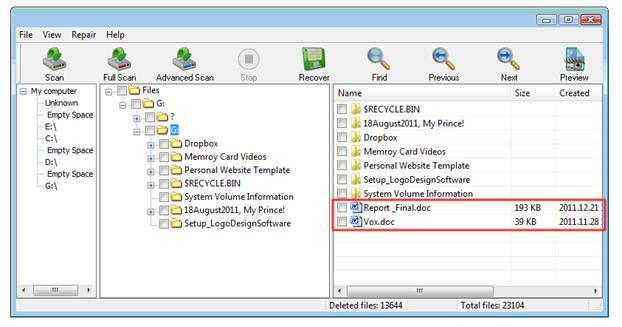 However by comparing the current contents Drive and the file contents enumerated by FineRecovery you can easily determine which folders and files you have deleted and can be recovered by the software. Overall, the interface is simple and extremely comprehensive. File recovery is a simple procedure with FineRecovery. 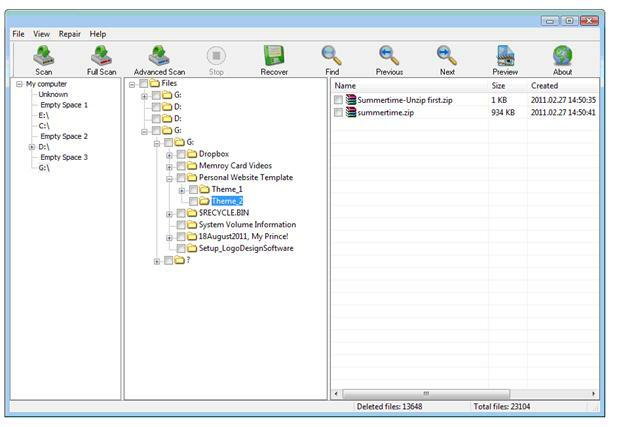 Simply launch FineRecovery and select the logical drive you want to recover data from. You have three options to scan your drive for deleted data. Either you can “Scan”, “Full Scan” or “Advance Scan” depending upon how severe system damage has caused data loss; Full and Advance Scan take substantial time depending on disk size. I found few of folders that were permanently deleted by Quick Scan. I proceeded to Full Scan for other folders, and thankfully found all. With the standard Windows Explorer you can expand folders on logical disk and inspect content in each folder/s. You can also recover files on the logical disk. The program enlists all the files it will recover. To preview the file you must select the file name and hit Preview Button on the Toolbar. The file will open in its default program. You can preview various types of files. In my test I previewed text documents, pdf files and images which turned out to be just fine! It was interesting for me to note that I was able to preview files some paid softwares failed to generate. 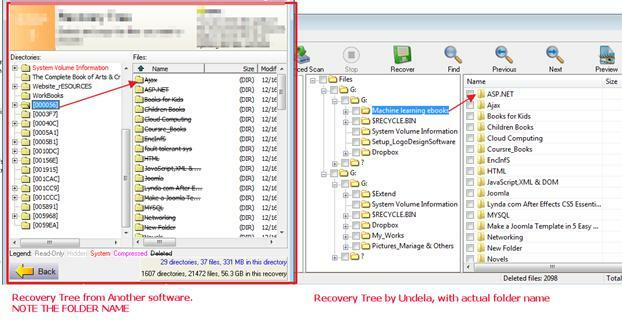 Compare the recovery tree of a paid software and FineRecovery! 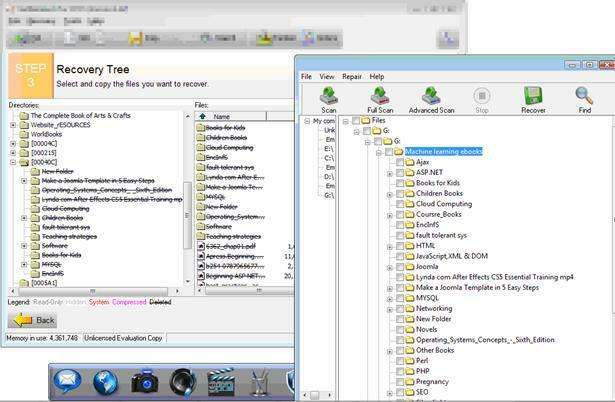 Notice the folder names which were renamed by paid software while FineRecovery was able to recover the file names correctly. You can search for files by their file names or by creating file masks. 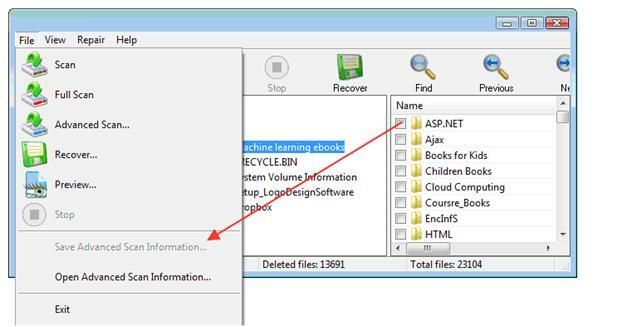 To find a file you can right-click a folder and select find from context menu or hit Find button on the toolbar. 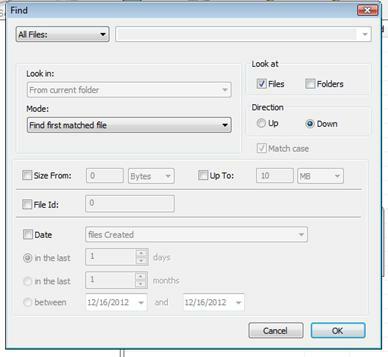 The find option gives the flexibility to find files and folders by data name and type. You can select individual files or folders you want to recover by checking the checkbox besides each file. It is recommended that you recover the files to drive other than that the damaged drive. After selecting a folder to recover, simply hit the recover button on the toolbar. 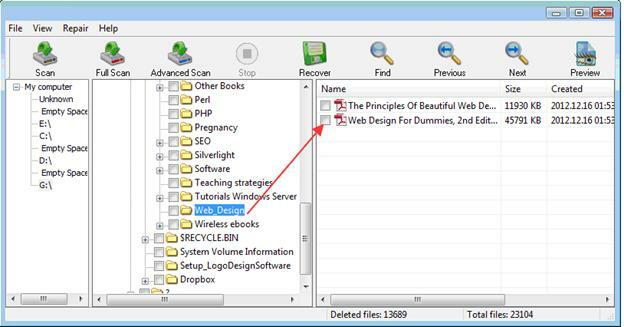 This wills popup a window that will prompt you to specify the destination of recovered folder. All the files and folders I investigated in the preview were shown with their original names. 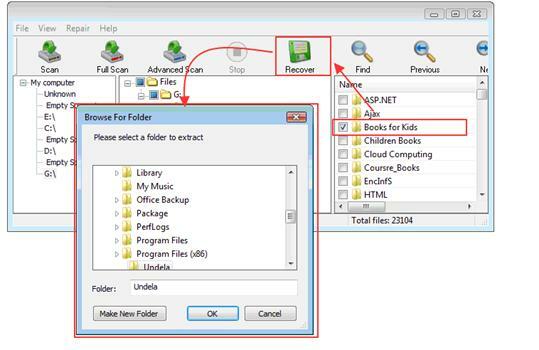 You can select multiple folders/files by checking more than one checkbox and recover them. 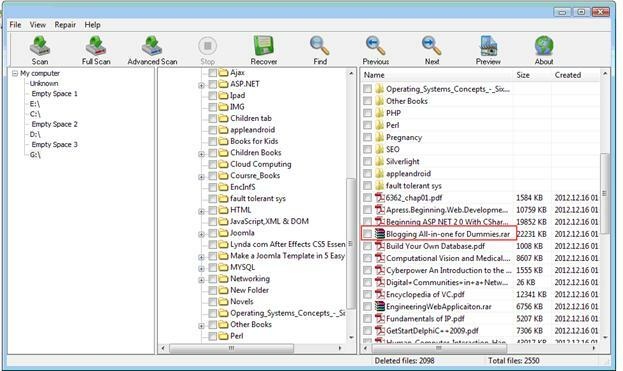 The software was able to recover huge folder, with files of which 99% were with their original names. Not only were the pdf files, images and word documents recovered but interestingly I was able to recover compressed files and setup files too! You can advance scan a logical disk in order to search for files that are lost due to crucial damage to your computer. Advance scan takes substantial time. Luckily you can save the result of advance scan and load it later for a detailed examination of drive. 1. Reliable Recovery: In my personal test, I found the software to be very efficient. The software recovered all the files and folders that were permanently deleted. All the files recovered by the software were in their original condition and were not damaged. I was also able to recover files which a competitor software which returned a deleted file to be of “0 Bytes”. Below I have compared the results of FineRecovery with a paid software while I tried to recover compressed files from both the software. 2. 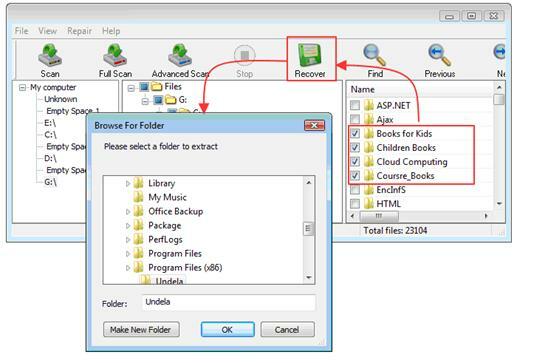 Safe: The software utilizes non-destructive, read-only file recovery approach and hence is perfectly safe to use. 3. 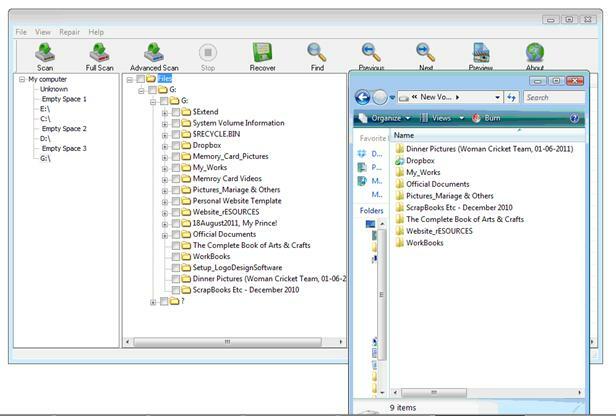 Files Names: The software displayed files and folders with their original names in the explorer while investigation. Additionally, when files were recovered, they were precisely names. None of the files was renames with alphanumeric characters. I must compare this to a paid software here. When I used a paid software for recovering the same drive I noticed that the file was renamed, however FineRecovery did recovered the file with its original name as shown in figure. 4. 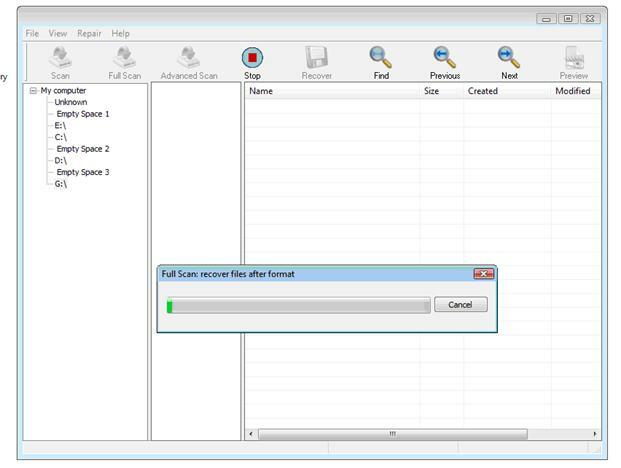 Batch recovery: The software enables easy, one-click batch recovery. No software in my test enables such a clear-cut way to recover folders/files in batches. 5. Comprehensive Software: By far the most exceptional feature of the software is its comprehensiveness and how it facilitates data recovery. With such a software, recovery was as easy as ABC—without exaggeration! 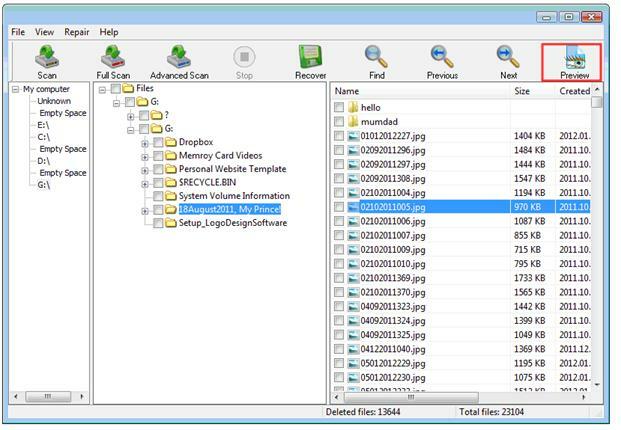 1- No indication for deleted folders via icon overlay: When you enumerate the content of logical disk from which you wish to recovery the program lists all the folders and files on the disk both deleted and undeleted. Unfortunately the program does not distinguish (with some small icon overlay, small cross or similar sign) among the deleted and undeleted folders. Have a look at the screenshot below. I have compared the content of Drive G: as viewed through FineRecovery and as seen via My Computer; the later showing the contents currently residing on the disk. As you can see there is no way to distinguish which folders are deleted and which are still present except for actually comparing the content manually. 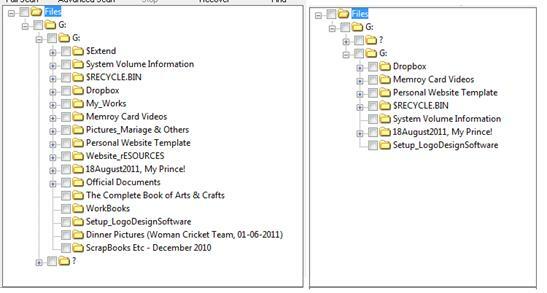 Below I have marked the individual folders which were deleted permanently and only viewable via FineRecovery. Having a small cross (or different overlay for indication) besides the icons for deleted folders will be quick way to distinguish the files which need to be recovered. 2- Poorly Elaborated user Manual: Though you might not need to reference the user guide, having an elaborated manual can be of very help. Particularly the manual needs to elaborate the process of recovery with screenshots. Having visual display of the recovery process can be of great help. 3- Full Scan Time: It would be nice to have a timer to indicate how much time is left while scanning the disk via Full Scan Option as full scan takes significant time depending on disk size. The software is extremely comprehensive and just like what a DIY Recovery software should be like, straightforward and uncomplicated. Usually when ordinary computer users lacking computer-know-how encounter data loss they consult professional data recovery services; without knowing the seriousness of the underlying problem (At times the data loss is not as crucial and recovery is quiet effortless if done at home). However, irrespective of severity of the situation, these data recovery services are considerably expensive and sometime costs you bucks that you could have otherwise prevented to spend by using DIY Recovery softwares. While looking into the recovery softwares I realized not many recovery softwares facilitate novice users and present a steep learning curve which is discouraging. FineRecovery thankfully, stands out. For recovering files with FineRecovery you won’t require any advanced knowledge of file system on your disk (having knowledge can be beneficial, though) prior to performing to recovery. The software can assist general non-technical computer users to effectively and easily recover their lost data. I specially appreciate the interface and how the software smoothes the process for casual computer users to get their lost data back without spending time, effort and money. For me, FineRecovery recovered files that some paid software were not able to do. As I pointed out before when I previewed deleted files with expensive recovery softwares they generated error that the files were damaged. 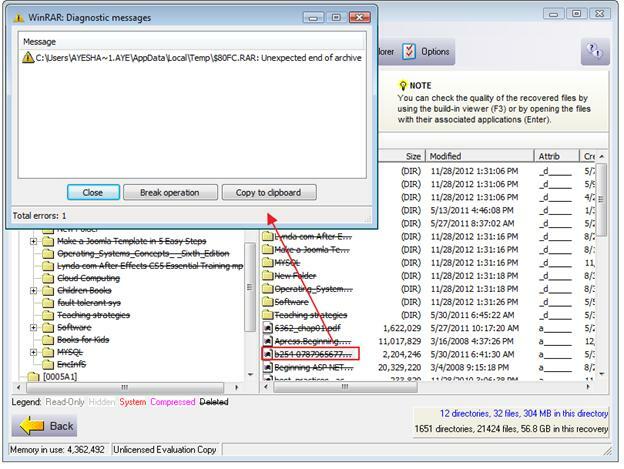 FineRecovery was able to recover the same files, completely undamaged and with their original names. Had I not found the software I would have lost data deluded that the data was damaged, when it was actually not. With the proliferation of computers and incorporation of technology in our lives we are in pressing need of software like FineRecovery which make technology, generally, easier for people like me reducing dependency on professionals. The whole practice teaches me yet another lesson. FineRecovery software are not degraded in quality and capability, in fact sometimes they are just better!